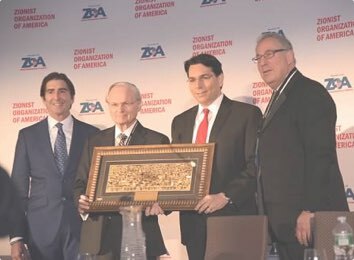 We write on behalf of the Zionist Organization of America (ZOA), the oldest and one of the largest pro-Israel organizations in the U.S., whose leaders have included U.S. Supreme Court Justice Louis Brandeis, Rabbi Stephen Wise, and Rabbi Dr. Abba Hillel Silver. 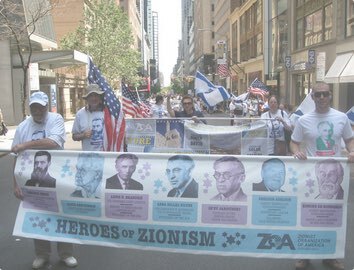 Much of ZOA’s work is dedicated to fighting anti-Semitism in all its forms, in schools and on college campuses. In the past 48 hours another two black men have been lynched by the police. The total number of black people lynched by cops in 2016 now totals 136. We must remember that many US police departments train with the #IsraeliDefenceForces [sic]. 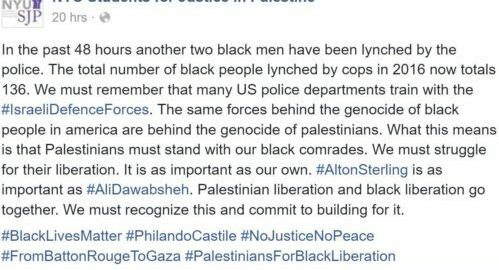 The same forces behind the genocide of black people in america are behind the genocide of palestinians. . . .
A copy of the SJP’s Facebook post is enclosed. All of us should be sickened by the SJP’s despicable tactics, not only lying about Israel’s actions toward the Palestinian Arabs, but also nefariously using Israel as the scapegoat for problems of racism in this country – problems which Israel could not possibly have anything to do with. How ludicrous it is for the SJP to claim that Israel would do anything to hurt the black community in this country when Israel dedicated enormous resources and endangered its own pilots by sending plane after plane to Ethiopia to rescue thousands of Ethiopian Jews from oppression, bringing them to Israel where they are full citizens and a vital part of Israeli society. Accordingly, as the leader of the NYU community, you have the right – and respectfully, the moral duty – to speak out against the SJP and the anti-Semitic lies it is deliberately and maliciously promoting to incite hatred of Jews and Israel. None of us should remain silent and tolerate this bigotry. It is up to you to take a leadership role: Please educate – and elevate – your community by condemning the SJP and its bigoted, anti-Semitic actions. In addition, we urge you to demand that the SJP issue an apology for promoting anti-Semitic falsehoods that are hateful and divisive, in violation of the principles and values of the NYU community. Morton A. Klein Susan B. Tuchman, Esq.